The inside of a shipwreck is one of the most hostile environments under water but it is also one of the most amazing and adventurous places divers like to go. This is where time stands still and you can imagine how the crew lived on ships from different eras. 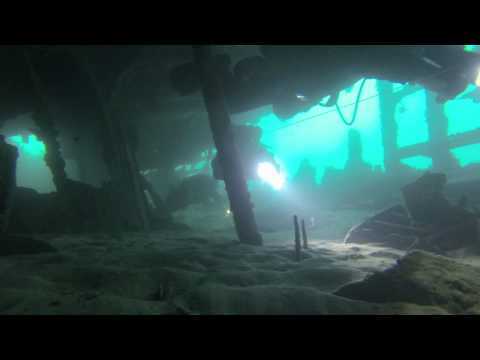 In modern ship wrecks the most amazing thing is to go down the ships engine room and see the once so active engine now stand completely still in the middle of a stroke, it is a sight to marvel at and remember long after the dive is completed. Wreck Diving is an activity that provides an incredible amount in the form of visual sights and excitement. But as much as wreck diving give you a fantastic experience, it requires of you that you do it safely. It is not difficult to swim inside a wreck, but to get out of a situation where visibility is reduced to zero and you also share gas with your team member requires that you have practiced the right action to make it all the way out. Going inside a wreck is easy. Getting out safely is the tricky part. The Wreck Diver course in SwedTech Diving provides you with the necessary basic training you need to become a capable and above all a safe wreck diver. You will learn how to move around safely inside the wreck, evaluate dangers and also communicate with your team mates. SwedTech Diving believes firmly that basic training is as a solid block on which each diver can build up skills effectively. Please contact any of our instructors to see about the possibility of arranging a class for you.